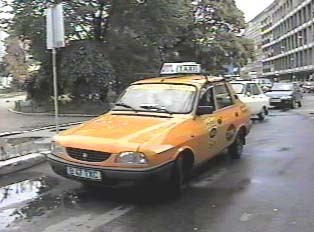 Taxis in Romania are owned by a variety of companies, and there is no standard color or design for a taxicab. However, all taxis have a license plate and a TAXI sign on their roofs. One can call for a cab, hail one, or simply go to a large intersection. When calling a cab, passengers should be prepared to give their location, phone number, the desired pick up time, how many people are traveling and the amount of luggage to be loaded. The driver will help load and unload the luggage. The cost of the ride is determined by distance; the meter should be set on the minimum cost. Payment is in cash and it is appropriate to leave a small tip by not asking to receive coins back as change. Some areas have many unregistered "taxis;" it is best to avoid using these. "Ordering a Taxi From Home"
"Ordering a Taxi From a Public Phone"
"Take me to Central Square"
"I want a taxi from _______ to Central Square."